Find hotel near Gasthof Linde Thomas Kran ..
Gasthof Linde Thomas Kranabetter is a place that takes you away from the noisy crowd. It is a Boarding House located at Bregenz, Austria. You can rest in one of the pretty and clean rooms in this 1890 building that will remind you of the lives of old folks of the city. While staying at this building, you feel fortunate to visit the contemporary art museum Kunsthaus Bregenz which is only 1.6 kms from here. There are simple bright rooms in this building that offer a courtyard view. You can enjoy delicious breakfast which comes free of cost. Try the best Bregenz trip planner to visit this Gasthof Linde Thomas Kranabetter as well as many others. Add comfortable hotels to your plan, choose from the recommended hotels in Bregenz like Hotel Gasthof Stift, Landhotel Mohren, Hotel Und Pension Seereich and Panoramahotel Sonnhalde. Draft the best Bregenz vacation packages using ideal templates offered by TripHobo. Also explore how to reach Bregenz on the go! Bus to S-Bahn station and 13-minute walk. How popular is Gasthof Linde Thomas Kranabetter? People normally club together Oberstadt and Seebuehne while planning their visit to Gasthof Linde Thomas Kranabetter. Food really good (both breakfast and the restaurant). Friendly staff. 3 stars becuase the room was really warm, it did not have air conditioning, but just a shacky ventilator. We could not open the window during night because the room was facing a big laud street. A very pretty hostal, with a good breakfast and cute decoration, but the reception only opens at restaurant times. 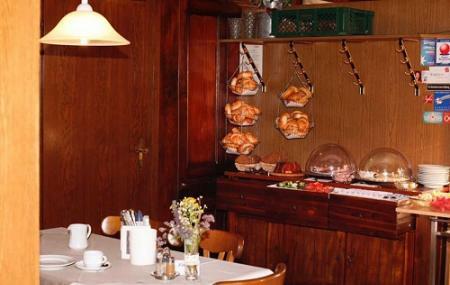 Gasthaus mit gutbürgerlicher Küche und großer Speisekarte. Hatten verschiedene Gerichte und jeder am Tisch war begeistert. Der Service ist sehr freundlich, aufmerksam und flott. Preis/Leistung stimmen hier absolut. Immer wieder gerne.